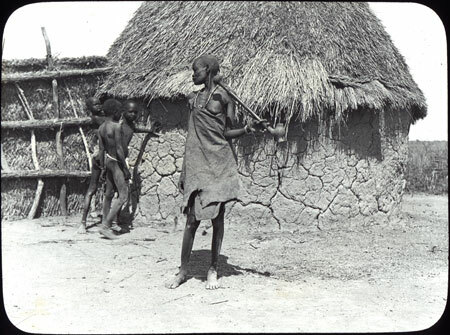 A woman standing near a hut with boys just behind her. In her hand is a long pipe. It is uncertain where this image was taken, but is probably on the Nile in either Shilluk or Dinka country in 1910. Manual catalogue entry (thermofax catalogue copy in folder '27-06 Seligman Slide Collection') - "V.g.3. Woman with pipe"
Note on lantern slide ms ink - "V.g.3. Woman with pipe." Morton, Chris. "Woman with pipe" Southern Sudan Project (in development). 03 Jan. 2006. Pitt Rivers Museum. <http://southernsudan.prm.ox.ac.uk/details/1967.26.207/>.